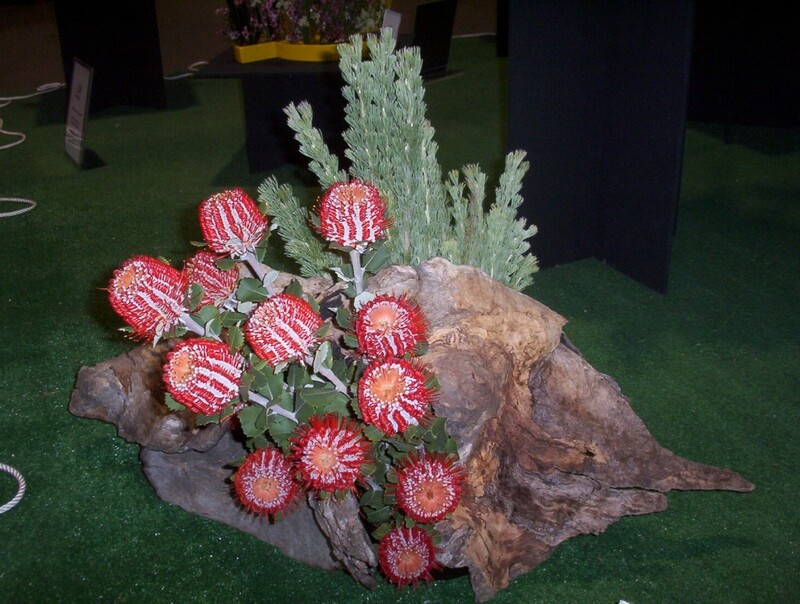 Australian native Plants in Flower Arrangements. At the latest Flower Show and Plant Sale put on by the Australian Plants Society in Adelaide were a number of wonderful floral arrangements using Australian native plants. I cannot recall the style in which these were done but all featured the bold and brash flowers. This one uses Banksia coccinea as the feature flower. In the background is the grey -green foliage from Adenanthos serieus (Woolly Bush). Woolly Bush is the easier of the two plants to grow and they are quite drought tolerant. I have seen few good specimens of Banksia coccinea in South Australian gardens. I believe they are being grown in the Hills for the cut flower trade. The soil in that region is less alkaline and well drained. As a rule of thumb, Banksias will grow where there is excellent drainage even if the soil is alkaline. The use of a mallee stump to form the arrangement makes this a truly unique Australian ‘picture’. Can you please tell me what types of plants i can plant and grow in droughtladen central queensland? Will any of htese plants grow in those conditions?